WIN! Masha and The Bear! Masha and The Bear – they’re the unlikely pair taking the world by storm! The hit children’s show follows many heart-warming tales of a three year old girl and her retired circus star friend, Bear. Masha is an energetic three-year-old who lives in an old train station in the forest. Precocious, silly, and friendly with everyone she meets, this energetic girl can’t seem to keep herself out of trouble. Her best buddy, Bear, is a warm, fatherly figure that does his best to keep Masha from harm, often ending up the unintended victim of her misadventures! Masha and the Bear entertains adults and children alike, teaching viewers about creativity, loyalty and true friendship. It airs weekdays at 8:30 AM on Cartoonito and is available to watch on Netflix and on the Masha and The Bear YouTube channel. The animation has now been watched over 12,000,000,000 times on YouTube which is equal to 160,000 years of watching episodes back to back! There is one particular episode which has been watched over one billion times,episode 17 of the Russian pre-school animation has now become the 13th most popular YouTube video of all time! We are offering twelve lucky readers the chance to win Masha and The Bear goodies from Simba Toys, including the exclusive Bear’s Bloxx House which is not available to buy in the UK! 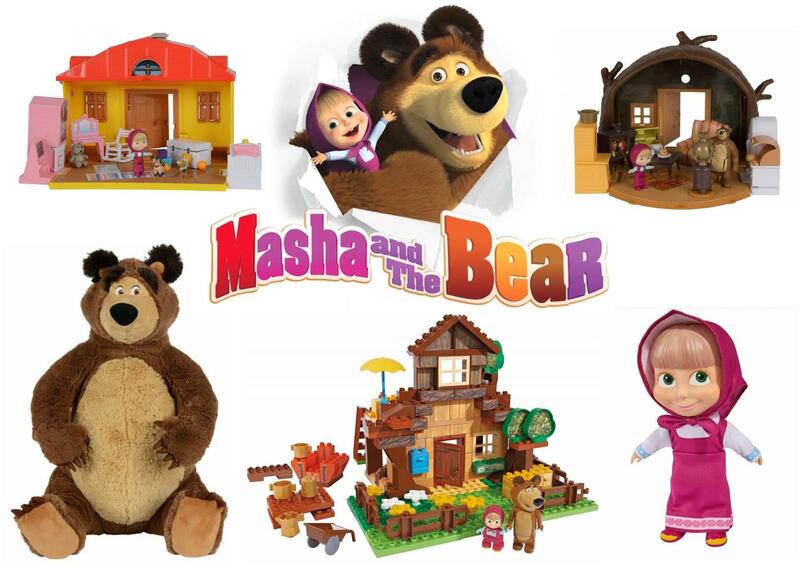 The Masha and the Bear toy collection ensures children can immerse themselves in the world of the large brown bear and the little girl and let their imagination run riot whilst creating their own Masha and The Bear adventures! Two lucky readers will win 1 x 50cm Bear Plush, 1 x 23cm Masha Soft Bodied Doll, 1 x Bear’s House Playset, 1 x Masha’s House Playset and 1 x PlayBig Bloxx Bear’s House. Ten runners up will win 1 x 35cm Bear Plush. Masha and the Bear airs weekdays at 8:30 AM on Cartoonito and is available to watch on the Masha and The Bear YouTube channel. *Prizes are suitable for ages three and up. For your chance to win visit us at www.facebook.com/lovedbyparents ‘like’ the post and write the words ‘Masha and The Bear’ in the comment box on the LBP page. Competition closes on the 9th April 2016.